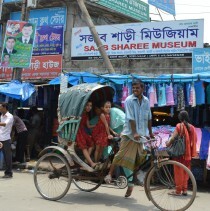 Hello from Dhaka! 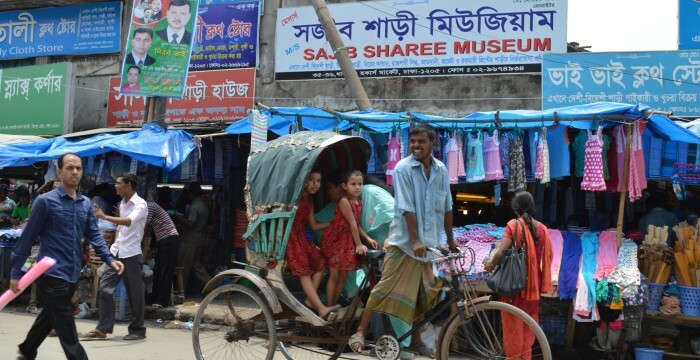 I came to Bangladesh with my daughter Koli and filmmaker Nandita Ahmed to make our second trip to Katakhali Village, Patuakhali District to continue work on Storytelling with Saris. I have completed a set of new woodblocks based on climate change themes. We were scheduled to be on a ferry to Katakhali on February 3. We were to be accompanied by Sardar Shafiqul Alam of the International Centre for Climate and Development (ICCAD), with whom I’ve been working on a climate information sharing and adaptation workshop for the Katakhali community. Unfortunately, the political situation in Bangladesh has taken a turn for the worse. The opposition parties have called for an indefinite transportation blockade and strike. People who are not abiding with the blockade (especially those traveling outside of Dhaka) are at risk of being attacked with Molotov cocktails or petrol bombs. Previously ferry boats had been safe, but this time even some of them have been attacked. We postponed our trip a few times but finally decided to cancel our trip to Katakhali as it is risky to travel 28 hours on the rivers. The airport is secure but there are no commercial flights anywhere near Katakhali. We recently learned about a chartered sea plane but unfortunately those planes are fully booked for the next two weeks. We are quite devastated but trying to make the best of the situation. Dhaka is functioning fairly normally so we are trying to do some work here. I met with Mr. Alam of ICCAD and learned about his research on gender and climate and Nandita filmed the interview. I have also met with the Katakhali project coordinator and am speaking with the Katakhali women by phone and getting updates and working on next steps. I will send more journals and materials so that the documentation and art work continues. I am also working with the coordinator to implement a climate adaptive agricultural training in Katakhali in spring. We will have to return to Bangladesh to go to Katakhali once the political situation stabilizes. We are so frustrated and disappointed and are heartbroken that so many people are being hurt by these criminals who claim a chance to govern. Meanwhile, arrangements for my first performance in Bangladesh are in full swing. It will be part of the One Billion Rising REVOLUTION 2015, a global event against gender-based violence taking place on Valentine’s Day. The 216-foot sari made by the women of Katakhali and featured in performances in DC, New York, New Jersey and Miami will be installed in the Bangladesh National Museum, along with a performance video and the Storytelling with Saris film. The exhibition is called “And Then” or “তারপর” and opened on February 10 and closes with the One Billion Rising REVOLUTION event on February 14 (3 to 6 pm), which will involve a number of street performances in front of the museum, culminating with taking down the sari from the Museum and performing with it. I am thrilled to be working on this project with One Billion Rising Bangladesh, who I met through the women of One Billion Rising Miami after they joined my performance during Art Basel-Miami Beach.